Empathetic gifts are unique and vary from individual to individual. Unless you know what your empathetic gift is, you cannot harness its true potential. 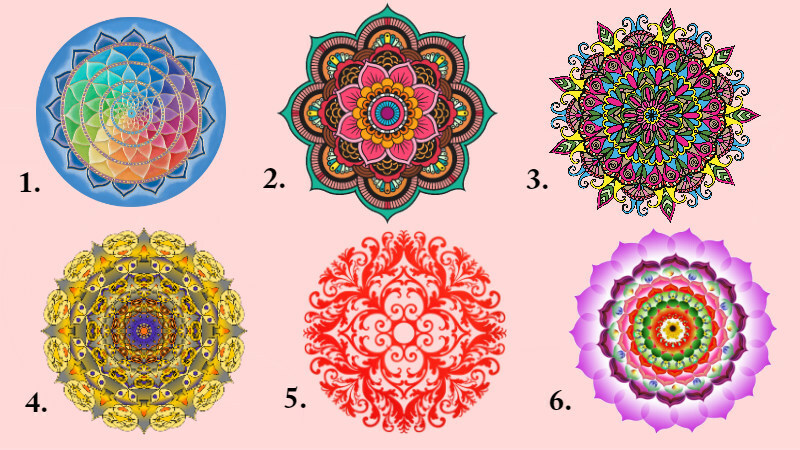 So here is a simple test where these mandala paintings will tell you more about your gift. 1. Picking up the very first mandala indicates that you are much closer to nature than anything else. You would much rather spend your free time surrounded in the green serenity of a natural environment rather than in noisy company. Nature is your friend and savior, someone you turn to every time you are tired, drained and ready to give up. You draw your energy and your strength by being around trees and other life forms which are part of the natural world order. You also channelize this to try and help others who might need it. 2. Painting number two is chosen by creature Empaths. You feel an incomprehensible bond to all the four legged creatures of the world. You are not a cat or a dog person. You have the same love for every cat, dog, reptile, elephant or any animal that comes your way. You are much more sensitive to their needs and it hurts you when people treat them badly. You also seem to have a connection which allows you to communicate with them without ever saying much. You’d devote as much energy and time as required every time you see an animal in distress. You will also like: Where Do You Belong? Find Out With This Definitive Religion And Spirituality Test! 3. If you choose the third painting it means that you are very perceptive about your surroundings. You are acutely aware of what’s playing out around you. Even if people say nothing, you are able to judge what is going on in their mind. More than that you feel the energy of the room and can guess what is going to happen soon. You tend to keep those people around you who are able to support you unconditionally and who don’t feed off on you. 4. Painting number four is favored by those Empaths who have a sort of passionate turn towards things. They care deeply about things. It is not in their nature to move on from things easily. In fact, the apathy of others troubles them to no end. But it simply makes them that much more firm in their resolve to help everyone they can. Just because they know that no one else might volunteer to help someone, they take it completely on their self to be the savior the world needs. 5. Those who choose the fifth painting are usually the energy Empaths. Everything is about energy and vibes and they are much more sensitive to the energies of other people. As soon as they find themselves around negative people they start feeling ineffable dread and sadness. They pick on the vibes of other people way too easily. So for their own happiness and sanity it is advised that they surround themselves with positive people who’d support them and not over tax their senses. 6. And finally the sixth empathetic gift is that of healing. If you are a healer empath, then you are naturally drawn to the practice of healing and health care. You are also much more aware of the problems and troubles faced by other people. You have a natural instinct about these things so you not just know what is wrong with someone’s health but also know exactly which remedy would work the best for them. Those who have this gift not only find great success in the medical professions, but they also have a unique sense of fulfillment which comes with using your gifts for the betterment of others.